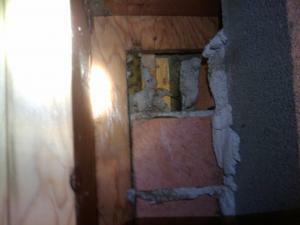 The wood is the sub-floor, and the brick is part of the fireplace. One of the bricks had broken in half and exposed the tack strip and carpet that was laid on top of it. The grey to the right is just carpet. The wood is the tack strip, and the gold and black stuff is the padding for the carpet. Also, the space between the brick and the wood? There's no caulk or sealant, it goes straight to the padding and carpet. This gap ran the entire length of the fireplace. After patching the hole, caulking everything, and insulating that space, it seems to be much less drafty. Imagine that.